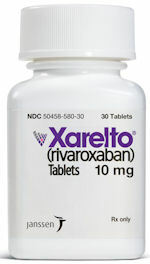 The courts are seeing an explosion in Xarelto products liability cases. The multi-district litigation docket (MDL) was only created in 2014 in the eastern district of Louisiana. Started out with 21 cases. By the end of 2014, there were more than 400 cases. By Dec 2015, the docket exploded to 2,400 cases. Six months later in April, 4,500 cases were filed. The litigation really took off in 2016 and there are now more than 15,000 cases. Right now is an excellent time to start a practice in mass torts cases involving Xarelto, a blood-thinning drug. The main driver is the first bellwether (test case) trial, which is coming up on April 24, 2017, with the second one scheduled for May 30. When that takes place, attorneys will see widespread marketing for clients and patients who took Xarelto. Marketing experts say the time to get involved is right now. The two defendant companies — Janssen Pharmaceuticals and Bayer — are facing a potential liability of $2.5 billion, based on settlements in similar cases. Estimates place the settlement value up to $500,000 in a wrongful death case, and the average settlement could be $162,000. At this point, it's very easy to get involved in Xarelto litigation. The court has established both short and long-form complaints. So essentially, all that an attorney needs to do is find a client and fill in the blanks as appropriate. The defense has put together a plaintiff fact sheet that goes through questions about the medical history of the patient, also available from the court, that's a fill-in-the-blanks sheet. A mass torts practice is quite different from typical personal injury cases where the facts and defendants change from client to client. With mass torts, an attorney has a fixed set of facts and defendants. The primary effort that needs to be put in is acquiring new clients. With more than 15,000 cases already, attorneys might be asking: are there any more plaintiffs out there to find? And the answer to that is yes — there are many more potential plaintiffs. More than 7 million people worldwide have been prescribed Xarelto, and at least 2 million Americans have atrial fibrillation that's treated with Xarelto. All of these people are potential plaintiffs. The two defendant companies are facing a potential liability of $2.5 billion, based on settlements in Pradaxa cases in 2014. The settlement value could be up to $500,000 in a wrongful death case, and the average settlement could be in the neighborhood of $160,000. Warfarin requires the doctor who prescribed it to monitor a patient's diet and dosage carefully. Xarelto, on the other hand, was marketed as a once-a-day dose, despite that it has a short half-life: between 5-9 hours. It is clear why Xarelto became a blockbuster drug for Johnson & Johnson: In 2014, the company had sales totaling $3.7 billion for Xarelto alone. Since Xarelto went on the market, the manufacturers ignored the dangers of Xarelto. It has no reversal agent or antidote, and can cause uncontrollable internal bleeding. Also, the plaintiffs allege that Xarelto can actually cause strokes and blood clots if discontinued abruptly. The plaintiffs also charge that the makers of the drug failed to warn users and actually concealed the fact that Xarelto causes uncontrolled internal bleeding. Arnold Palmer took Xarelto and died on September 25, 2016, which was preceded in August 2016 by surgery for gastrointestinal bleeding. Meanwhile, Janssen and Bayer continue to advertise Xarelto aggressively. One TV commercial featured comedian Kevin Nealon, NASCAR driver Brian Vickers and Hall of Fame golfer Arnold Palmer. The 87-year old Palmer wore a pink sweater and said, “Treatment with Xarelto was the right move for us.” Many people are wondering if that is true in the wake of his death on September 25, 2016, which was preceded in August 2016 by surgery for gastrointestinal bleeding. See Did Xarelto, the Drug Arnold Palmer Promoted, Lead to His Death? The vast majority of Xarelto cases are in multidistrict litigation Eastern District of Louisiana before Judge Eldon Fallon, where the bellwether trial is coming up. Meanwhile, a smaller cluster of 1,100 claims have been filed in the Philadelphia Court of Common Pleas in Pennsylvania state court before Judge Arnold New. Finally, there's a small group of 31 cases in California Superior Court before Judge Kenneth Freeman in Los Angeles. The plaintiff in the April 24 bellwether trial is Joseph Boudreaux, Jr. in Lafourche Parish, Louisiana. He was prescribed Xarelto in 2014 for atrial fibrillation. He only took the drug for 21 days before he suffered severe gastrointestinal bleeding, and he survived only because of several blood transfusions. Evidence will be presented at the trial how Bayer and Janssen ignored many danger signals. In 2013, the FDA required that Xarelto include a warning that premature discontinuation of Xarelto® increases the risk blood clots. In 2014, the FDA required that Xarelto include a warning that it can cause internal bleeding. The warning must also state that a specific antidote is not available for Xarelto. The prevailing view about a settlement is that nothing will happen until the litigation affects the stock price of Bayer and Johnson & Johnson. This may happen this year, based on settlements involving a similar blood thinner called Pradaxa. Pradaxa was approved in 2010 before Xarelto and it was a commercial success, generating huge sales for Boehringer-Ingelheim. Unfortunately, like Xarelto, Pradaxa didn't have an antidote for bleeding. Thousands of lawsuits were filed, and in 2014, Boehringer-Ingelheim settled 4,000 cases in state and federal courts for $650 million. Individual settlements ranged from $500,000 to $12,000. For purposes of calculating how big a settlement for Xarelto might be, lawyers can start with the average Pradaxa settlement of $162,500. When multiplied by the 15,611 cases that are currently filed in the federal MDL, this produces a potential liability of $2.53 billion. This is why Xarelto is an attractive addition to a personal injury practice. How do you get more clients? To learn about attracting potential clients for Xarelto cases, watch the webinar sponsored by LawLytics, the suite for law firm websites. Do you have questions about marketing a mass torts practice? LawLytics can help. Call at 800-713-0161 or schedule our call.